UVM’s Rubenstein School, Environmental Program, Department of Art and Art History, and Lattie Coor Fellows in Environmental Humanities are happy to co-host eco-artist, engineer, and environmental health physician Natalie Jeremijenko in a Talk and Conversation to take place Wednesday, April 19, at 6:00 p.m. at Carpenter Auditorium, 131 Given, UVM campus. Known for her public art interventions around the world, Jeremijenko is a new media artist who works at the intersections of contemporary conceptual art and ecological design. 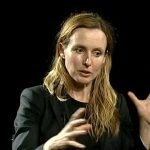 As the New York Times has written, Jeremijenko “reimagines environmentalism as a kind of open-ended game” that aims to respond to the “crisis of agency,” or “what can we do?” Her TED talk on “The Art of the Eco-Mindshift” has been viewed over 400,000 times. Trained in art, computer science and engineering, and neuroscience, Jeremijenko has taught at New York University (where she directs the xDesign Environmental Health Clinic & Lab), Yale, UC San Diego, and the Royal College of Art in London; exhibited at the Whitney Biennial of American Art, the Victoria and Albert Museum London, MOMA, the Gemeentemuseum in The Hague, and the Kuenstlerhaus Vienna; been profiled in Salon (“The Artist as Mad Scientist“), the New York Times Magazine (“The Artist Who Talks with the Fishes“), Technology Review, and The Economist; and been named a Rockefeller Fellow, one of the Most Influential Women in Technology (Fast Company, 2011), and a VIDA Art and Aritificial Life International Pioneer Prize winner. Her recent projects reimagine urban farming, zoos, environmental health, transportation, and cross-species adventures, and include a proposal to incorporate Burlington into “PLAN B,” a multi-city strategy for creative urban infrastructure transformation that would meet and exceed the goals set at the outcome of the COP 21 Paris Climate Convention. (The other “B cities” include Boulder, Bogota, Berlin, Beijing, Barcelona, and Brisbane.) She has just finished a 10 week residency at Stowe’s Helen Day Art Center and completed a public installation “Quadrivium” at Spruce Peak, which has provided an initiation for the Plan B of Burlington (and beyond). She is also working on a draft proclamation to the governor of Vermont for culture-led initiatives that will provide significant human and environmental health improvements, improve soil, water and air quality, and increase biodiversity. For further information on this talk and other UVM events involving Natalie Jeremijenko, please contact Prof. Adrian Ivakhiv, Steven Rubenstein Professor for Environmental and Natural Resources, and Organizing Fellow, Lattie Coor Fellows in Environmental Humanities, at aivakhiv@uvm.edu. Thanks for finally writing about >Jeremijenko visit | A(s)cene <Loved it!